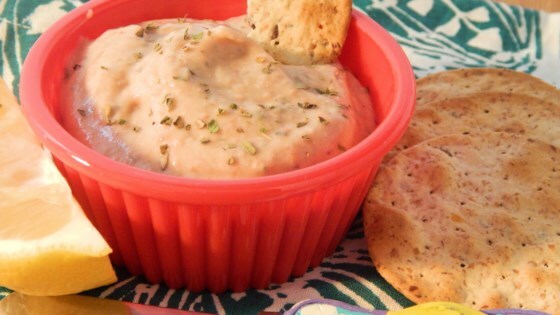 "This is a quick and easy spread/dip that's perfect for last minute company. Can be served with French bread, crostini, crudites, toast points, or crackers." In a blender or food processor, blend the pinto beans, cottage cheese, garlic, lemon juice, parsley, dill, butter, and seasoned salt until smooth. Chill at least 1 hour in the refrigerator before serving. This is a very good alternative to hummous. Very easy to make. I made it w/out the dill and it was fine without. Very good as a spread on bread. LOVE it! Great spread on a tortilla with a little bit of salsa! Makes for an awesome lunch or small dinner. I was skeptical of this but it was such a great easy spread! We didn't care for this. The texture is odd - very pasty. There isn't much flavor to speak of. Sorry - I wanted to like it, but this just isn't for us. My husband and I found this dip to be nothing like hummus. The texture was too pasty, and the flavors did not mix well. Thanks for the recipe. We are always looking for new things to try.